On a daily basis, students in Core Connections Geometry use problem-solving strategies, questioning, investigating, analyzing critically, gathering and constructing evidence, and communicating rigorous arguments justifying their thinking. Students learn in collaboration with others while sharing information, expertise, and ideas. Geometric transformations (reflection, rotation, translation, dilation) and symmetry. Proofs of geometric theorems (investigating patterns to make conjectures, and formally proving them). Using coordinates to prove geometric theorems. 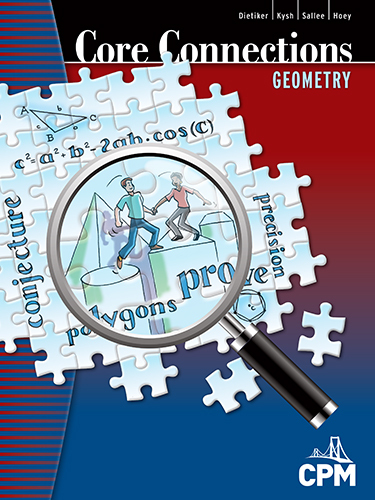 Tools for analyzing and measuring right triangles, general triangles, and complex shapes (such as the Pythagorean Theorem, trigonometric ratios, and the Laws of Sines and Cosines). Geometric constructions (with compass and straightedge). Using algebra to formulate and solve equations arising from geometric situations.